Good February morning to you each and all. Crispy Hot Buttered Sour Dough Toast and Earl Grey Tea with 1/2 and 1/2 made me joyfully ready to begin this day, the first of February. Normally, I only eat seeds and nuts and dried fruit in the morning with my tea, but today I gave myself the delight of toast.This is going to be a powerful year, I feel it. My world of photography has taken a leap with a new commitment, a new friend (I’ve graduated to an Epson 7890), and a new photography website, and studio/office coming in this week. Before you read our new blog post here, click on the image above; then, come on back. Trying to describe Cosmo Sheldrake requires a lot of adjectives, and that will save me some, because it will be super apparent to you from the get-go who Cosmo is, and what talent he has! Based in London and Brighton, Cosmo also sings and performs with Merlin in their band the Gentle Mystics, OH YEAH! More of this please! In this crazy beautiful dangerous world, we need more gentle mystics. But back to Cosmo. From the first moment I met him, I wished he were my rich uncle and I could go live with him in his castle in the British countryside. I was taken by his joyful spirit, his obvious talent and sonic gifts of music and song, which are infused with poetry, art, nature, history, and culture. His sounds are old and new all at once. He just made life more fun. Cosmo is on his way up and out into the world, and I am so glad to be able to introduce him to the Teen Talking Circle world. 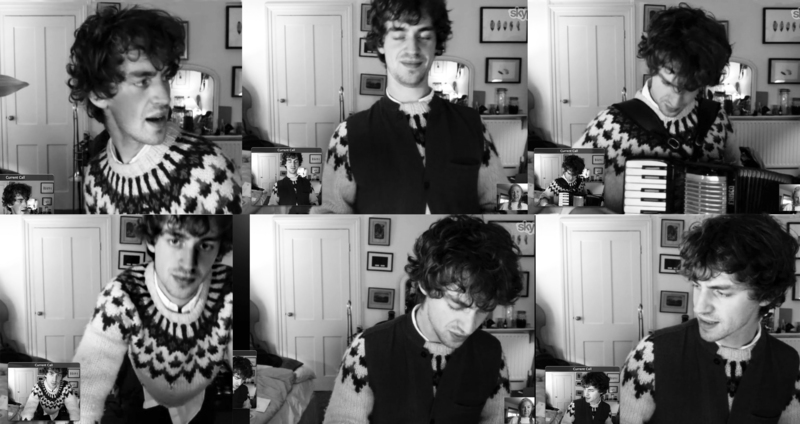 Follow the golden crumbs and enjoy learning about, watching and listening to Cosmo Sheldrake. All this said, we must remember every one of us starts at 0 with a drive or a passion, calling or vision and Cosmo is the first to say, if you have a vision, follow it –you must! — and hopefully you will be unfettered. I’ll quote William Blake here since Cosmo did him the honor of making a song from his poem, The Fly. Cosmo is a reminder to us all to trust ourselves, and just plunge in and stick with it. Linda Wolf: Cosmo, hello! So, tell me, what’s up? Cosmo: As of today, I’ve just started to record a new album. I don’t have any idea quite yet where it’s going. I’m just starting to write it. It’s open-ended, actually. Linda: How great. Where do you get your inspiration? Cosmo: All sorts of places. I go on sound-foraging missions. I do a lot of field recording so a lot of the sounds or impetuses will become origins of tunes. Sometimes, I’ll hear a tune on the radio and a tiny fragment will just stick in my head. Today, I was listening to Leonard Cohen on the train, and there was a tiny turn of phrase in The Partisan that stuck with me – a style of guitar plucking that ended up influencing the tune I’m making today. One time I was lying in India and there was a power cut and when it came back on there was this fan that started making this incredible noise and I recorded it, and made a tune out of the rhythm. Linda: What a beautiful song. Linda: Do personal relationships enter into your writing? Cosmo: Yes, I’ve written a lot of songs for my girlfriend, Flora, and I write a lot of songs for family so yes, I love to write music specifically for certain people — and for specific times of day for those people. For Flora, for example, I’ve been making a series that starts with a lullaby — a piece of music that was made out of Owl songs for the night time, and then one of the dawn chorus for waking up, and one with whale songs called Music for Bathtubs. Linda: Wow, a series of pieces that includes music for her baths. That is so beautiful. I love it. How old were you when you started making music? 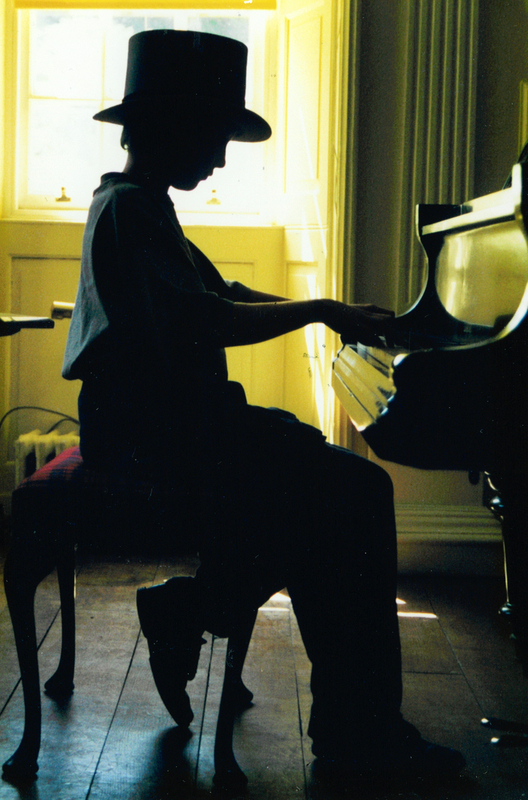 Cosmo: I was four when I started taking lessons on the piano. Before that, my parents packed me off to various classes that try to get young people clapping and playing glockenspiel and such. My brother, Merlin, had already started lessons and I was a bit jealous. My father made us practice, which I’m actually grateful for. Often young musicians quit if nobody is holding them accountable. It requires either a lot of personal will power or a structure to help them keep practicing. I was made to practice for 20 minutes a day and rewarded with dried fruit at the end. But when I was about thirteen I decided I wanted to stop lessons. It was a bit of a struggle because my dad was invested as he used to sit with us while we practiced. To him it was quite heart breaking that I wanted to quit. I both regret and don’t regret stopping lessons. I learned a lot from them. I never stopped playing. I carried on improvising. Linda: Were other members of your family also playing? Cosmo: My father always played piano and my mom was teaching workshops around the voice and chanting. And there were always musicians around the house. I was playing and listening to a lot of jazz, blues, and boogie-woogie when I was seven. When I was twelve, my mom gave me a recording of Keith Jarrett, The Köln Concert, and Miles Davis’s, Sketches in Spain. I fell in love with both of them; they were very influential. Linda: Would you say the music you play today is in a genre of it’s own? Or is it a combination of forms? Cosmo: When I first started, I was making hip-hop beats. I like to bring a lot of different sounds and styles together. I can trace in hindsight the influences on my music. I always struggle when people ask me what kind of music I make. What I’ve started saying is it’s sort of a collage, sort of cut and pasting, because I take bits and pieces from so many styles and places. Linda: That idea of cut-ups was something William S Burroughs did quite a bit with his writing. Would you be wiling to play a little for me right now? Linda: Can you support yourself with music? Cosmo: I’ve had to just so I can carry on making it so that I don’t have to sacrifice my time by finding another way to make money and squash music into spare time. The ideal state is that an artist can live off their art. It’s never the primary goal. As long as I can use my time to make music and earn enough to keep it going, for the time being that’s all I want. Linda: Do you worry about your future? Cosmo: Financially? Or just in general? 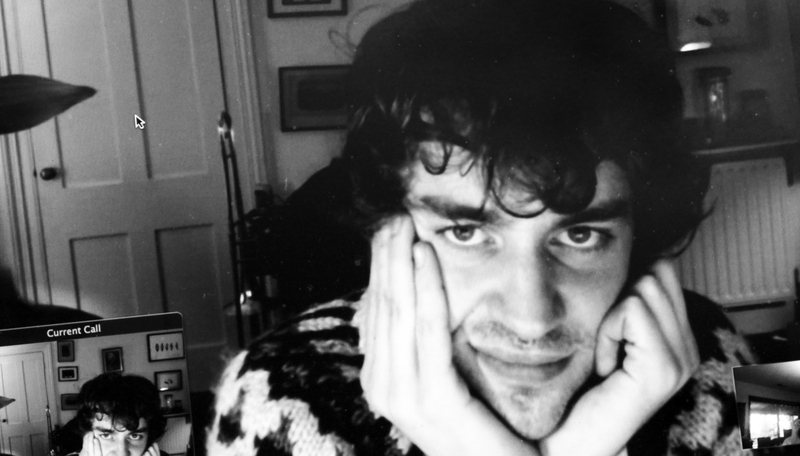 Cosmo: I have worried in the past but I have this sense of trust that things will work out. In the beginning, I had all this energy and motivation but no real way of getting it out. My music hadn’t realized itself yet, and I felt like I was smashing my head against a wall. But now, I don’t spend a lot of time worrying about it. I have a sense of trust and faith. Linda: Do you have a spiritual life or religious life that you draw upon? Cosmo: Well, I guess, both. Musically, I sang in the Church choir when I was younger and I’d been brought up going to Church. But, some of my most profound connections to music have been in ceremony. The power of music in that kind of sacred space is an awesome thing and has definitely had a profound impact on me. I’ve also been inspired by poets like William Blake, who is a visionary and a mythical force. I’ve put some of his poems to music. I did a workshop with Bobby McFerrin in New York once. He’s a deeply religious and spiritual man and the way he led improvisation circles was extraordinary. People would get in states of complete frenzy, and have huge awakenings. He frames it as being a vessel or channel — these are my words, not his. There are many sorts of devotional forms of music – Sufi devotional music, for example. There is so much power in it and is amazing how it can move people. I definitely aspire to that and am interested in the question as to what the contemporary meaning of devotional music looks like for us Western Europeans and North Americans. The Christian tradition has hymns, but when I’m in Church singing hymns, I’m not profoundly moved by the music. Some of the most powerful musical experiences I’ve have, have been singing — mainly improvising — late at night with groups of people, somewhere. Linda: How you deal with the present realities of the world situation, which seem to be pretty much out of control? Like global warming, over-population, terrorism, hunger, the economy, the environment, beheading, etc. Cosmo: I go in cycles, I suppose. Sometimes, I feel despair and other times I feel much more optimistic. When I was younger, I was more proactive and angry and I protested. When I got older, I was more involved with working with people than just stamping my feet. Linda: You just got off the road with Johnny Flynn and have been more and more in the public eye. How does it feel performing in front of hundreds or thousands of people? Do you ever feel insecure? Cosmo: Yes, sometimes insecurity worms its way up. Performing in front of people has been a journey. I remember my first performance; I was unable to even look up. I just kept my head down, staring at my feet, but slowly I got more comfortable. I grew up learning Suzuki Piano, where everyone plays and performs to other people, very multigenerational. I think what I get the most uncomfortable about or nervous or shy about are people’s reactions afterwards, after I’ve performed. People put performers in general on pedestals – I’ve done it myself to people, it’s something we do. Linda: I understand. It’s so human. You have a powerful family that has had its share of being in the public eye. Your mother, Jill Purce, is well known as a pioneer in the sound healing movement, your father, Rupert Sheldrake, is a well-known intellectual, scientist, and a controversial figure, and your brother, Merlin has won the highest praise and awards at Cambridge. Have you felt competitive? Cosmo: With Merlin? Yes, certainly, at points, but not generally. We’re very different. There were periods of time when I didn’t really care about school, wasn’t really engaged or working, and he was doing fantastically well. And I think just generally the younger/older thing in sibling relationships often have these patterns, which are very easy to slip into, but no, I wouldn’t say our relationship is a competitive one. I’m inspired by Merlin; by his ability to frame huge concepts, structures or narratives in tiny details. He has a powerful eye for detail without ever losing sight of the bigger picture. And the sense of discipline and rigorousness he has. When he gets his mind going on something he’ll completely zone in. My general disposition is quite the opposite – its big broad-brush strokes and less about the details. Linda: How have you been inspired by your father? Cosmo: In lots of ways. His resilience and ability to stay completely grounded, focused, positive and light in the face of some very severe opposition. He’s had to put up with a lot of personal attacks. When I was about a boy, I watched a BBC piece about his new book, A New Science of Life, that had just come out. The opening shot was a shocking picture of his face being set alight. So the first or second time I ever saw him on TV was his face burning and he was being branded as a heretic. They called his book a book for burning. I’m very inspired by him being able to see the bigger picture and not get dragged down by the personal attacks he’s gotten and just carry on being positive. Linda: I remember when he was stabbed while doing a speaking engagement. That was something. And your mother? How does your mother inspire you? Cosmo: Lots of ways. Of course, her work with overtone chanting has led me towards my fascination with Mongolian music. But watching her in the space she holds in workshops as she’s facilitating; some of the stuff that comes up is so intense especially in the family workshops. And it’s intense from 10am till 11pm and sometimes she does week-long ones. She never loses focus. She has remarkable ability and concentration. She holds so many people in intense situations so calmly and in such a safe way that the whole group has great trust and faith. It mystifies me where she gets that concentration. Linda: Your mother pioneered Family Constellations, where people work with others in the room who sort of take on the persona of deceased family members. What do you believe happens when we die? Cosmo: There is a sheer wealth and thousands of accounts of near-death experiences where people say they experience a sort of bliss state. I think death would be similar to dreaming, an extended dream. Linda: I remember thinking death and old age were so far away when I was young. I smoked and did dangerous things, but now I marvel at young people who take massive risks, even just still smoking cigarettes when they know they’re cancer causing. Cosmo: I don’t think young people have changed that much since you were a young person. Young people feel they need to learn their own lessons. That’s part of the problem with the general education system. Young people will always be slightly self-destructive, I think. That may be a huge generalization. Generally, people are more wild when they are young and get more domesticated when they’re older. And I think that’s probably a good thing. Linda: Death is much more present for us older folks, I think. If we live long enough, if we are lucky to live into old age, we have to make end of life plans and talk about them with our adult children. Hard subjects. Do you talk about these things as a family? Do you know what your parents want? Cosmo: They’ve never gone through it all with us, but I know that my dad is very strong that he hates the idea of it all being some super medicalized environment.. I’m fairly sure both of them would not want that. I’m sure they would like to be at home and have it be a peaceful and organic experience. I think they’re very much against the idea of spending some exceptional amount of money trying to keep people alive in their last week, and leaving their next of kin in vast debt. Death is treated like some kind of failure of medicine. Linda: Do you have any advice for young people? Cosmo: This may sound cheesy but one thing that has benefited me is not compromising. There were many points when I’d be asked, maybe my mom or others would ask how are you going to make money. I think it’s important to have a sense of trust, I guess. Linda: Yes, a friend of mine recently said to me that when we venture out and risk in order to reach a goal, it’s like walking a tight rope – we have to keep our eyes on the distance, and not look down at the rope. She said it was like not over-thinking things, giving ourselves a chance to find all the reasons we might fail in out attempts. Cosmo: Yeah, if someone has a vision of something they want to do, so many things like that get compromised because of pressures to be realistic. They get questions like, ‘how are you going to do that? How are you going to make that happen?’ So, for me, I think it’s really important to just dive headfirst and give it a go because unless they do, how is it ever going to happen? And generally speaking, it gets harder and harder as people get older and more entrenched in social and familial responsibilities. So, I’d say, and maybe it’s not my place to say it, but carry on charging through, and don’t listen to anyone if you’ve got a creative vision; follow it through. Linda: I totally agree with you. Cosmo’s upcoming schedule is listed on his website. You can also join him through his FB page. Follow this guy – he is a true Pied Piper! I just love him!